If your dream is a monolithic staircase, start your work by developing a detailed drawing that will allow you to determine the number of steps, their width and height. All steps must have the same dimensions. If you decide to make a curved monolithic staircase, then in the narrowest part of the step its width should not be less than 12 centimeters (otherwise the probability of stumbling, falling and getting injured during its operation will be great). When making a drawing, pay attention also to its width. A staircase already 80 centimeters will be inconvenient for climbing along it, or for bringing furniture or stretchers along with a person lying on it. 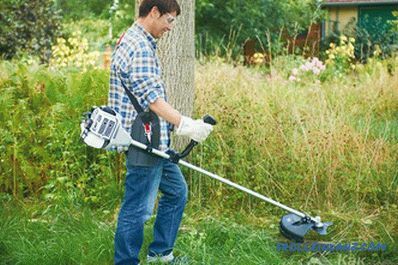 The most convenient is the width of 1 meter. Also, do not forget about the intermediate platforms. It is advisable to make them every 12-15 steps, so that a rising person can rest a little. 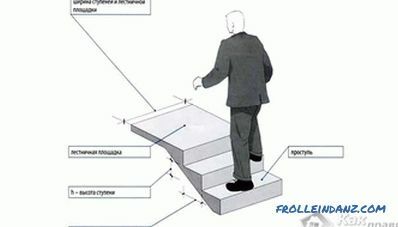 If the configuration of the opening does not allow an intermediate platform to be made at the place where the stairs are turning, you can perform the run-in steps there. Monolithic stairs with their own hands should be made of high-strength concrete with obligatory reinforcement with grids of its lower part (on which all the steps are located). For the mesh, you can take reinforcing rods with a diameter of 10-12 mm and arrange them in 15 cm increments. 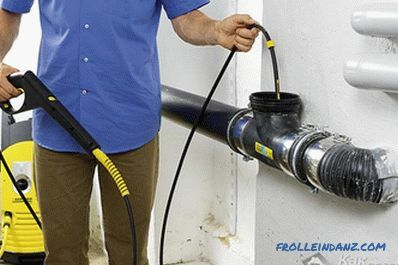 You must tie the rods together with a wire. If the stairs are large in height and width, then better lay reinforcing mesh in two layers, between which leave a space of two centimeters in height. The ends of the horizontal reinforcing bars should be hammered into the wall. 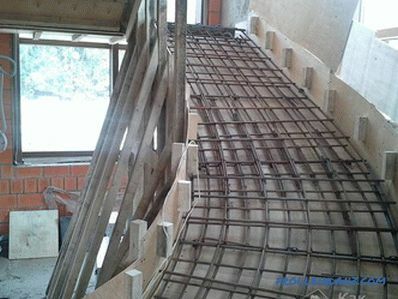 The bottom (flat) part of the formwork should make of thick moisture-resistant laminated plywood, supporting it from below with boards of five-centimeter thickness. 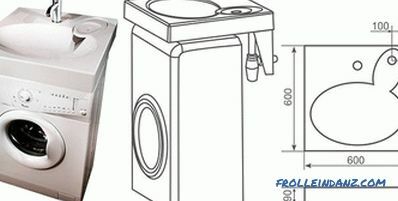 The step of props usually corresponds to the size of the step. Planks should be laid between the plywood and vertical supports to reinforce the entire structure. At the side, the edge of the stairs is also limited to plywood, which will not allow concrete to leave its intended place. 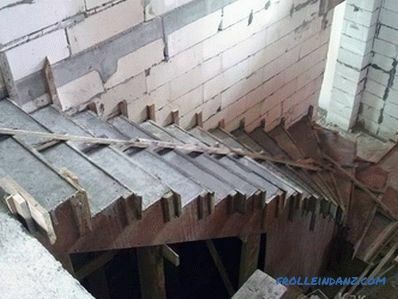 The flanging is additionally enhanced by longitudinally laid boards (on the outside of the formwork), since the plywood itself cannot withstand the pressure of concrete without deformation (but on the other hand, it gives a flat surface on the side and bottom of the stairs). 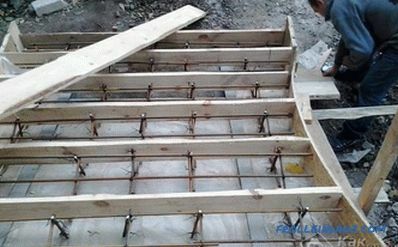 The reinforcing meshes must be laid on top of the bottom of the plywood formwork, securing them so that they are about 2 cm above the plywood. Such a gap will create a protective layer of concrete above the reinforcement, which will prevent its damage and oxidation. 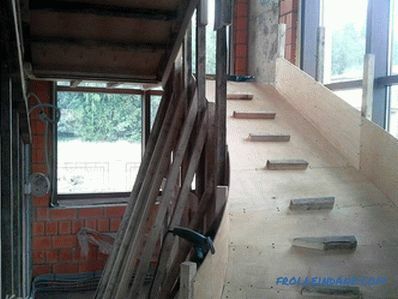 To create the risers (vertical parts of the step), boards are also installed (5 cm thick), which are fastened with metal corners to the wall from one side and to the flange plywood from the other. 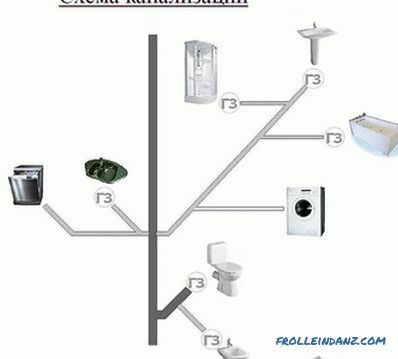 The lower step of the ladder should be fixed, reinforcing it with a horizontal stop from the board. 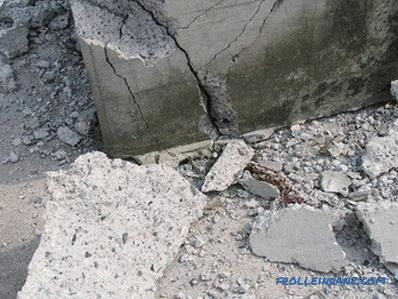 Concrete for monolithic stairs should be ordered for RBU (it is problematic to prepare such a volume of high-quality concrete in a small concrete mixer, as until you make the next batch, the previously poured concrete is already grabbed). First, two or three lower steps of the stairs are poured. 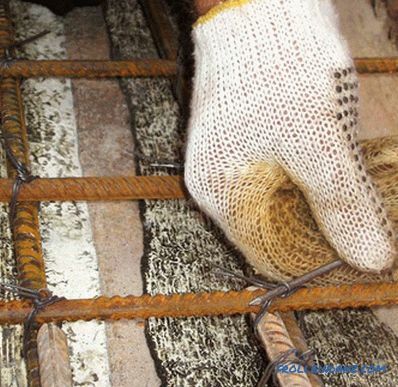 Be sure to tamp the poured concrete, piercing it with a piece of reinforcement to remove the remaining air in its thickness and fill all the space between the formwork and the reinforcing mesh. 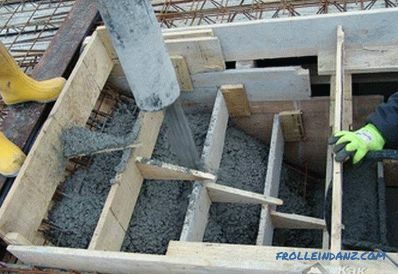 The concrete that squeezed out during this procedure should be transferred from the lower stages to the upper stages. Having formed the lower steps, proceed to the pouring of the steps above. 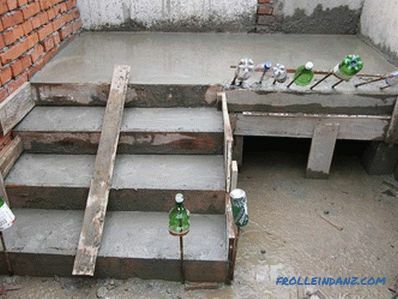 Do not forget to level the surfaces of the steps as they are finally filled and the concrete sets. 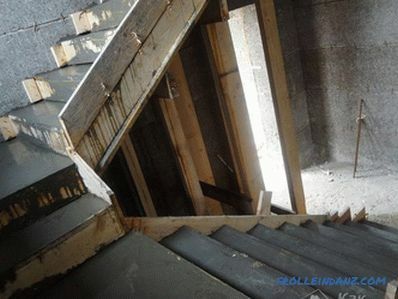 in 14-21 days you can remove the vertical supports and remove the lower formwork from plywood. 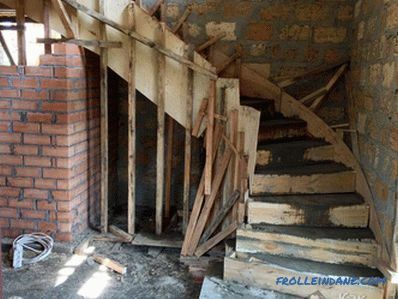 If you plan to further support the newly created monolithic staircase with supports for the formwork above the floor, you will have to wait for the concrete to gain full strength (this will happen no earlier than 28 days from the moment the stairs are cast).There is no need to hurry in this case, since it will be almost impossible to repair later the damage caused by the excessive weight of the formwork with concrete. fireplace portal (step by step instruction).